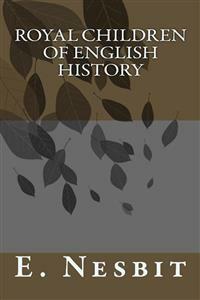 This book presents the history of Royal Children of Kingdom of England. - Alfred the Great - Prince Arthur - Henry the Third - The First Prince of Wales - Edward the Black Prince - Henry the Fifth and the Baby King. I hope you do not think anything so foolish, because, really, history is a story, a story of things that happened to real live people in our England years ago; and the things that are happening here and now, and that are put in the newspapers, will be history for little children one of these days. The people in those old times were the same kind of people who live now. Mothers loved their children then, and fathers worked for them, just as mothers and fathers do now, and children then were good or bad, as the case might be, just as little children are now. And the people you read about in history were real live people, who were good and bad, and glad and sorry, just as people are now-a-days. You know that if you were to set out on a journey from one end of England to another, wherever you went, through fields and woods and lanes, you would still be in the kingdom of Queen Victoria. But once upon a time, hundreds of years ago, if a child had set out to ride, he might have begun his ride in the morning in one kingdom, and finished it in the evening in another, because England was not one great kingdom then as it is now, but was divided up into seven pieces, with a king to look after each, and these seven kings were always quarrelling with each other and trying to take each other's kingdom away, just as you might see seven naughty children, each with a plot of garden, trying to take each other's gardens and spoiling each other's flowers in their wicked quarrels. But presently came one King, named Egbert, who was stronger than all the others; so he managed to put himself at the head of all the kingdoms, and he was the first King of all England. But though he had got the other kings to give in to him, he did not have at all a peaceful time. There were some very fierce wild pirates, called Danes, who used to come sailing across the North Sea in ships with carved swans' heads at the prow, and hundreds of fighting men aboard. Their own country was bleak and desolate, and they were greedy and wanted the pleasant English land. So they used to come and land in all sorts of places along the sea-shore, and then they would march across the fields and kill the peaceful farmers, and set fire to their houses, and take their sheep and cows. Or sometimes they would drive them out, and live in the farmhouses themselves. Of course, the English people were not going to stand this; so they were always fighting to drive the Danes away when they came here. Egbert's son allowed the Danes to grow very strong in England, and when he died he left several sons, like the kings in the fairy tales; and the first of these princes was made King, but he could not beat the Danes, and then the second one was made King, but he could not beat the Danes. In the fairy tales, you know, it is always the youngest prince who has all the good fortune, and in this story the same thing happened. This prince did what none of his brothers could do. He drove out the Danes from England, and gave his people a chance of being quiet and happy and good. His name was Alfred. "Since you like the book so much, I will give it to the one who is first able to read it, and to say all the poetry in it by heart." The eldest prince tried to learn it, but I suppose he did not try hard enough; and the other princes tried, but I fear they were too lazy. But you may be quite sure the youngest prince did the right thing. He learnt to read, and then he set to work to learn the poems by heart; and it was a proud day for him and for the Queen when he was able to say all the beautiful poetry to her. She put the book into his hands for his very own, and they kissed each other with tears of pride and pleasure. You must not suppose that King Alfred drove out the Danes without much trouble, much thought, and much hard work. Trouble, thought, and hard work are the only three spells the fairies have left us, so of course he had to use them. He was made King just after the Danes had gained a great victory, and for the first eight years of his reign he was fighting them continually. At one time they had conquered almost the whole of England, and they would have killed Alfred if they could have found him. You know, a wise prince always disguises himself when danger becomes very great. So Alfred disguised himself as a farm labourer, and went to live with a farmer, who used to make him feed the beasts and help about the farm, and had no idea that this labourer was the great King himself. One day the farmer's wife went out--perhaps she went out to milk the cows; at any rate it was some important business--and she had made some cakes for supper, and she saw Alfred sitting idle in the kitchen, so she asked him to look after the cakes, to see that they did not burn. Alfred said he would. But he had just received some news about the Danes, and he was thinking and thinking and thinking over this, and he forgot all about the cakes, and when the farmer's wife came in she found them burnt black as coal. "Oh, you silly, greedy fellow," she said, "you can eat cakes fast enough; but you can't even take the trouble to bake them when other people take the trouble to make them for you." And I have heard that she even slapped his face. He bore it all very patiently. "I am very sorry," he said, "but I was thinking of other things." Just at that moment her husband came in followed by several strangers, and, to the good woman's astonishment, they all fell on their knees and greeted her husband's labourer as their King. "We have beaten the Danes," they said, "and everyone is asking where is King Alfred? You must come back with us." "Forgive me," cried the woman. "I didn't think of your being the King." "Forgive me," said Alfred, kindly. "I didn't think of your cakes being burnt."